How often are the tasks run? Curator is a tool that allows you to take regular/scheduled actions against the indices in your cluster, based on pre-defined filters. At ObjectRocket, we’ve integrated Curator into our service so you can configure it via the UI and let us handle the day to day maintenance and execution of Curator itself. Create: Create a new index. Today, this must follow a Delete/Close action. Task Name: The name for the task. This is a required field and just a description of what this task will do. Task Type: You can select to Delete the indices which match the filters, or Close them to writes and queries. This is a required field. Add / Remove: When the Alias Task Type is selected, you can specify separate filters for the indices you’d like to add to the alias and the indices you’d like to remove from the alias. Filter by age: Allows you to set a filter based on the age of the index. The age is based on the creation date of the index. 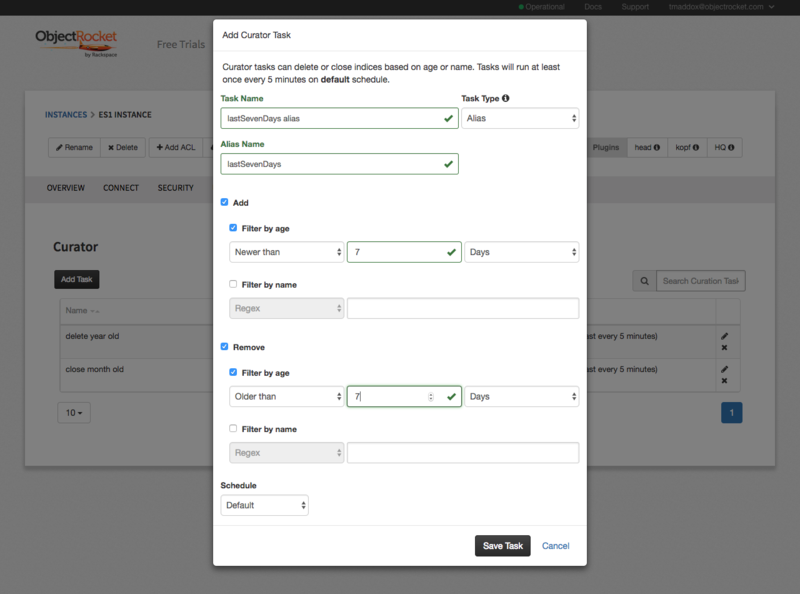 Filter by name: Allows you to set a filter based on the naming convention or RegEx. Schedule: Determines how often to run Curator. 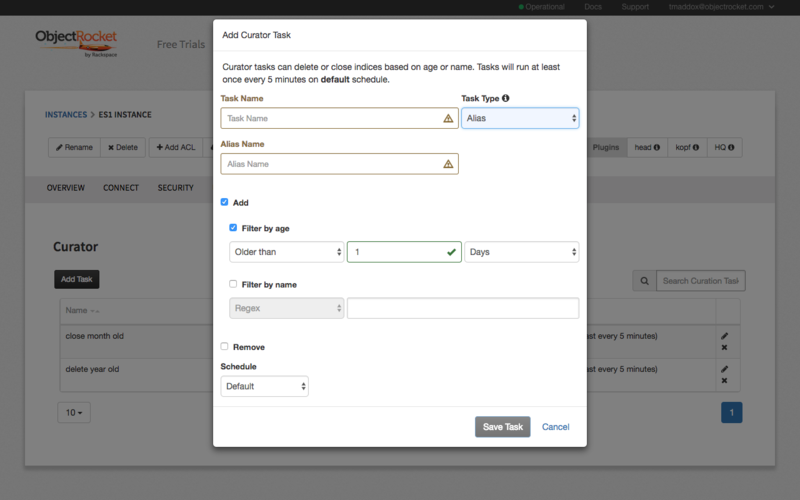 The default is every 5 minutes, but tasks can also be scheduled to run at specific times. Create a new index…: If a Close or Delete event occurs, you have the option of creating a new index based on the name pattern provided. You are required to select at least one of the filters and if both are selected, action will only be taken against indices that match BOTH filters. By default each task is run at least once every 5 minutes. If there are no indices returned by the filters, no action is performed. Every month on the specified day and time. If you select day 31, that task will run on the last day of the month in shorter months. For this Tutorial, the scenario is an environment where you would like to maintain an alias for the indices covering only the last 7 days. This example will use the Alias action in Curator to maintain the alias. We can leave it at the default interval (every 5 minutes) to specify that we want this task to run pretty regularly to keep our alias up-to-date. We can go ahead and select “Save Task” and that’s it! 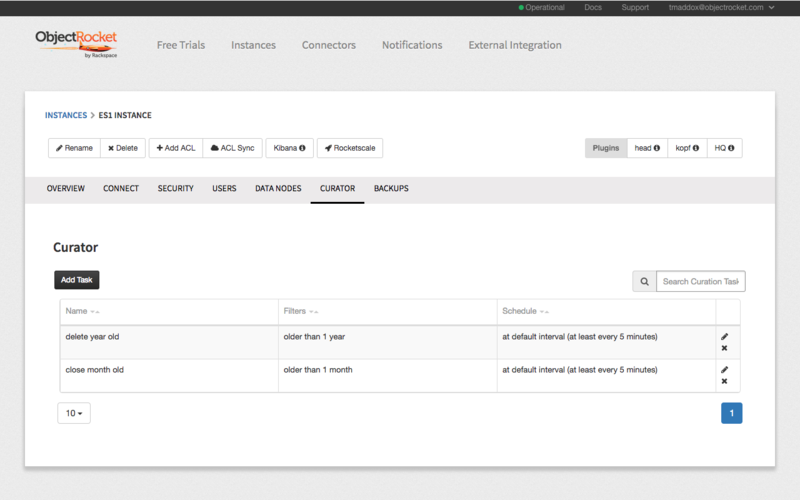 Now the task will run every 5 minutes to keep the Elasticsearch Alias updated. We’ll be regularly adding more options to our Curator support, so if there’s an action, filter, or option that you need, or if you have any further questions about Curator in general, feel free to let us know by sending a ticket to support@objectrocket.com!